SUNDAYS, 11-12:30 : AFRO CUBAN DANCE CLASS with KATI HERNÁNDEZ! TUESDAYS: AFRO CUBAN RUMBA with KATI HERNÁNDEZ! 7-8:15 PM-LEVEL 1; 8:15 PM-LEVEL 2. This series of classes is a comprehensive and systematic program designed for learning the basics of authentic Afro-Cuban RUMBA! Women participants should bring long scarves, or long, full skirts. $20/class. MID CITY ARTS ANNEX 8503 Pickford St, Los Angeles, 90035. For more info contact Kati at happyhappykati@gmail.com. SATURDAYS, 3:30-5 PM: AFRO CUBAN DANCE with JUAN CARLOS BLANCO, former soloist with CUBA's esteemed folkloric company RAÍCES PROFUNDAS, and presently director of OMO ACHÉ, Afro Cuban folkloric group based in San Diego. The workshops are held @ STAGE 7 SCHOOL of DANCE, 3090 30th St., North Park, San Diego. $15/class. $12-students. For other class & performance info, plus videos, visit omoachecubanculture.org . SUNDAYS, 12-1 PM: AFRO CUBAN PERCUSSION w/ JUAN CARLOS BLANCO, director of OMO ACHÉ , San Diego based AFRO CUBAN folkloric company. WORLD BEAT CENTER, 2100 Park Blvd., San Diego 92101. All levels welcome! World Beat Center has drums to rent ($5) in case you don’t have one! $5/class. TUESDAYS, 7-8 PM: AFRO CUBAN DANCE with WILFREDO GUILBIAC, at DANCING UNLIMITED, 4569 30th St., San Diego 92116. THURSDAYS: JUAN CARLOS BLANCO teaches AFRO CUBAN ORISHA SONG (5-6 PM), BEGINNING AFRO CUBAN DANCE (6-7:15 PM) with LIVE DRUMMING ACCOMPANIMENT at CENTRO de la RAZA, 2004 Park Blvd. (Balboa Park), San Diego 92101. $10/class (each class can be taken separately). SUNDAYS (first & third of month): RUEDA in the PARK offers a FREE RUEDA de CASINO CLASS in GRIFFITH PARK near the Merry-Go-Round (rear parking area). Beginners 11-12 noon, intermediate 12-1 PM w/ TANIA. ((take Crystal Springs Rd. east off of Los Feliz and look for Merry-Go-Round signs). For more info: Rueda in the Park on FaceBook. 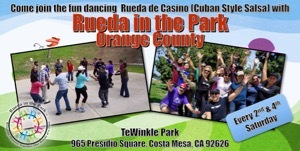 SATURDAYS (every 2nd & 4th Sat), RUEDA in THE PARK-ORANGE COUNTY offers classes of RUEDA de CASINO: Beginning Level 11:30 AM; Intermediate Level 12:30 PM-1:30 PM. $5/class. TEWINKLE PARK, 965 Presidio Sq., Costa Mesa 92626. TUESDAYS, 8-9 PM: CASINO with PARTNERS with WILFREDO GUILBIAC at DANCING UNLIMITED, 4569 30th St., San Diego 92116. THURSDAYS, 7-8 PM: BEGINNER RUEDA de CASINO with WILFREDO GUILBIAC at DANCING UNLIMITED, 4569 30th St., San Diego 92116. THURSDAYS, 8-9 PM: INTERMEDIATE RUEDA de CASINO with WILFREDO GUILBIAC at DANCING UNLIMITED, 4569 30th St., San Diego 92116. SATURDAYS, 1-2 PM: BEGINNER RUEDA de CASINO with WILFREDO GUILBIAC at DANCING UNLIMITED, 4569 30th St., San Diego 92116. SATURDAYS, 1-2 PM: INTERMEDIATE RUEDA de CASINO with WILFREDO GUILBIAC at DANCING UNLIMITED, 4569 30th St., San Diego 92116. Starting MAY 1: SUNDAYS, 2-3:30 PM: BEGINNING LEVEL CASINO & RUEDA de CASINO, 5-WEEK SERIES with VIDAL CORDOVA. $30 for series if you register before May 1; $40 after. Class to be held at A TIME TO DANCE SAN DIEGO. More in: salsacasinosandiego@gmail.com. Registration: eventbrite.com. SUNDAYS, 10:30 AM: AFRO BRAZILIAN DANCE with VIDA VIERA at The Electric Lodge, 1416 Electric Ave. Venice, CA. 90291. TUESDAYS, 8-9:30 pm: AFRO BRAZILIAN DANCE: AFRO CUBAN DANCE with Luiz BADARO, artistic director of VIVER BRASIL, at DANCE ARTS ACADEMY, 731 S. La Brea Ave., LA 90036, (323) 932-6230. $15/single classLive drumming. $3-$5 donation basket for the drummers to keep drumming alive! (323) 465-4762 for more class info. www.viverbrasil.com.